Why Did Dustin Morgan Cry at Woodstock? Hendrix goes straight from “Voodoo Child” into the opening notes of “The Star Spangled Banner”. He raises his arm high in a salute to the crowd, his fingers formed into the peace sign. The adoring audience flashes the sign back in unison. The twisted, exploding version of the National Anthem paints the picture of everything the revolution stands for, and Morgan knows he is part of it. Woodstock has sealed the deal; he has sold his soul. A great swelling of emotion rises up in his heart, and he cannot contain it. He raises both hands into the air, with his fingers forming the “V”, and cries like a baby. Just as this generation of free spirits was certain that the Great Establishment wanted to enslave them and force their ways down their throats, they adopted the same role of tyranny, forcing their ideas of how things should be down everybody else’s throats. Now, the radical fanatics living in the glass dome in Eastern Wyoming really do want to make the whole world like Woodstock. They want everybody to share everything. And if you don’t want to share what you have, then into the concentration camp you go! If you don’t agree with their ideas of social behavior and political correctness, then too bad, they are going to force their view of what is right and proper on you. 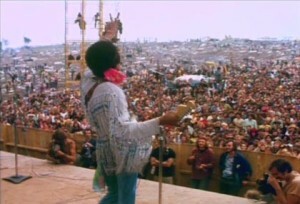 Unfortunately or fortunately, however you see it, the Woodstock fever faded away after a few short years. Oh, it’s still around in aging hippies, hip centers and liberal ideology, but the massive wave of hip culture has been pushed into obscurity. On the other hand, consider a fever that has not faded away, but has only grown over the last 2,000 years. 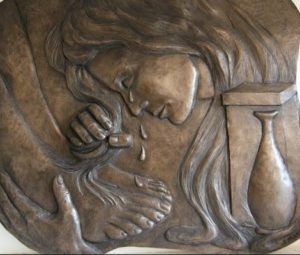 Consider the woman at Bethany, anointing Jesus with costly oil and wiping His feet with her hair and her tears. Why was this woman crying? In many ways, for the same reason Dustin Morgan cried at Woodstock. A truth bigger than herself had revealed itself to her. A truth bigger that the earth, or the universe, had suddenly taken root in her heart. This Man before her had come down from heaven to save her and deliver her from her sin. He was God in human flesh. And He came here to show the world there is a God, and His Son is Jesus, and He is going to transform the world with His love. Not only that, He had just transformed her. Knowing that this Son Who was sitting right in front of her had taken away her sin and made her a new person demanded that she give him her full devotion. So, she poured out all that she had to anoint Him for burial.